Well, if only 10 were made I guess you should be very lucky to find one. 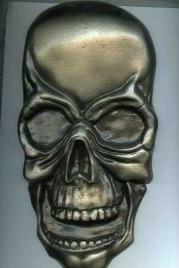 It's a cast iron metal skull which has the all the aces cd in a recess in the back. They were given out as competition prizes in a tv show called raw power. It has a custom logo sticker on the front of the box stating what number it is. Only 10 were made. It also has a larger skull sticker on the back of the box. Two copies have been sold on Ebay. The funny thing is that both these were no 4. The first one was sold in 2004 and the sticker loked slightly torn. The second one was sold two years later but the sticker now looked intact. What does this mean? Are there two number 4? Does that imply the existence of more than 10 copies? Record collector valued this item a while back at �0. A number 4 was sold on Ebay in July 2004 for �0. Another number 4 (the same?) was sold for �5 in February 2006, also on Ebay. Number 10 was sold on Ebay in September 2006 for �8.